Once you have passed your Surf Lifeguard Award, Surf Life Saving offers opportunities for you to increase your skillbase in many areas and every year offers numerous courses to acheive this. 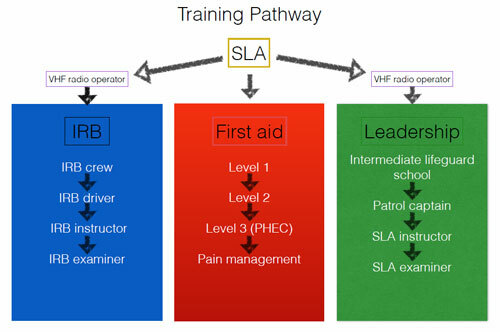 The training pathway is laid out below but you can choose to follow more than one pathway in the same year. We do, however, recommend you only attend a maximum of one course per pathway each year, as this gives time for the skills to consolidate and strengthen, ready to move onto the next level. If you are interested in attending any of these courses please go to Orewa Surf Club training and fill in your details. When the next courses come up we will notify you.